In the ancient Cretan city of Pergamon (Pergamum) is said to be the City and Throne of Satan, and home to one of the seven churches written about by Saint John in the Book of Revelation. 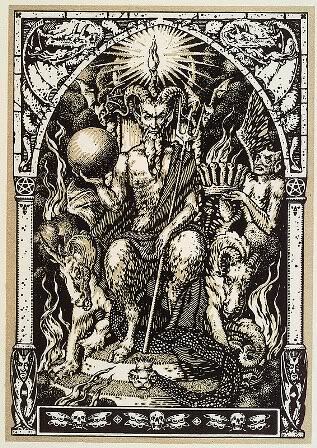 It was the original uncorrupted church of Christ that later became the seat of Antichrist or Throne of Satan. Today, this church would represent the Catholic from the time of Constantine, and onward. For the church it represents the principal seat at Rome, where Satan dwelt, Revelation 2:13; which signifies exalted likewise; and it introduces the man of sin, antichrist, the popes of Rome, who exalted themselves above all that is called God, princes, kings, and emperors. The original city of Pergamon and possibly another throne of Satan I have found to be in the exact location where in the Old world where you would most likely find the ancient Greek God of wisdom, medicine, healing, rejuvenation and physicians known as ‘Asclepius’. His temple was known as the Sanctuary of Asclepius which was one of the most famous schools, libraries and medical centers (hospitals) ever known in the ancient world. Many Gnostics and priests of healing were born and trained at Pergamon such as Galen who was the main disciple of the Kohanim Levite and Father of Medicine, Hippocrates. Even many Roman emperors whose ancestors came from these lands would travel all the way from Rome to be treated here. The ancient city of Pergamon was originally located on the Holy Island of Crete approximately 18 miles inland from the west coast. 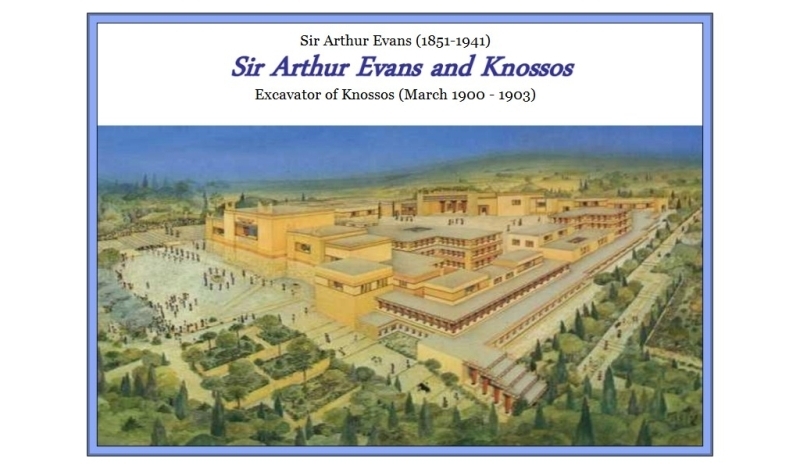 It lies opposite the Island of Dia (Cos, Chios, Patmos) to the west of Mount Ida and Knossos was as well. (1) It was said to be on the river Caicus almost half way between Smyrna on the south, and Troy on the north. Pliny places it between the city of Sidonia (Cydonia) and the city of Kisamos. It was the capital under the Cretan King Attalus who was the friend of the Romans in 133 B.C. 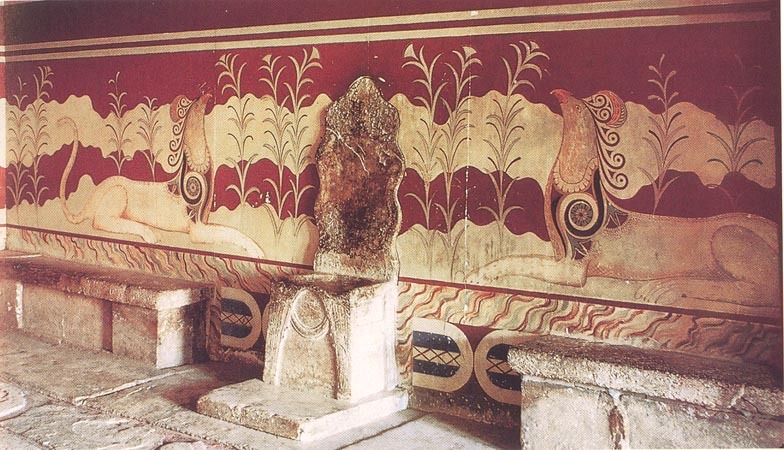 In the famous City of Knossos and royal temple we might be able to find this famous throne of Satan that sits here vacant to this very day. 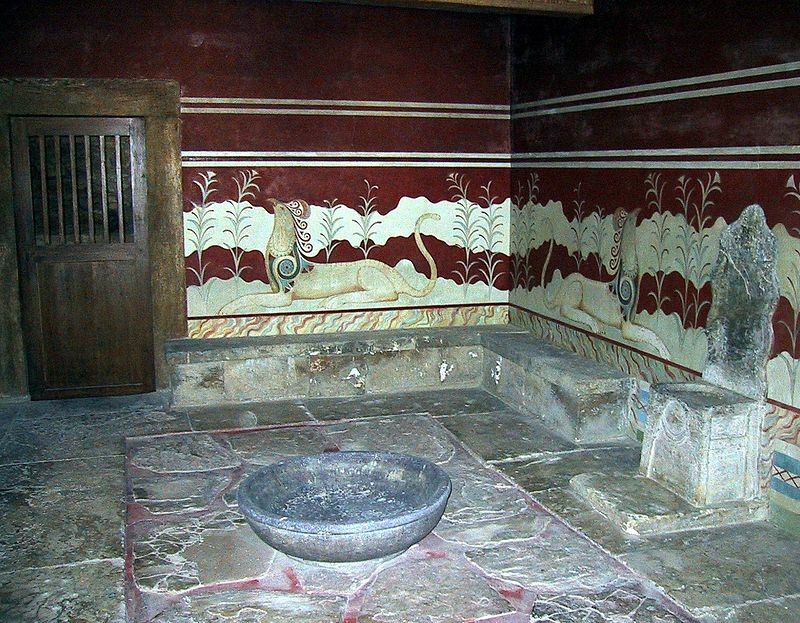 Here are two actual images below of what I believe to be the original so-called “Throne of Satan” in the “Throne Room” on Crete. The throne is surrounded by several griffins couchant (lying down) facing the throne, one on either side. The Cretans were also known by many other names such as the Phoenicians, Minoans, Arcadians and the Phrygians. In Greek myth,the king of Mycenae or Argos, Agamemnon went to Crete after the Trojan war and there founded three cities: Mycenae, Tegea, and Pergamum. Another story tells us that at Polyrrhenia his captives revolted while he was performing a sacrifice, and he escaped with only one ship. He was the son (or grandson) of Atreus, king of Mycenae, and his wife Europe. In the Iliad the Cretan Idomeneus is a vassal of Agamemnon. The fugitive Trojans amalgamated with Cretans under Aeneas, son of the Trojan Aeneas and a Cretan woman, and founded Pergamum. Lappa was also said to owe its origin to Agamemnon. According to another report the Trojan Aeneas was the founder of Pergamum, and Talthybius of Mycenae was the founder of Tegea. Author Robert Pashley, talks about the curse of Agamemnon on the warriors who remained in Crete in his book Travels in Crete, where he had written; “Diodorus Siculus, in one of the fragments published from the Vatican Palimpsest, mentions a curse of Agamemnon on the warriors who remained in Crete, and likewise an old proverb of the island, in which the Pergamians are spoken of as the authors of the calamity. I suppose the warriors in question to be those who deserted their Chieftain here, and that the word Pergamians denotes the founders of this Cretan city, rather than the inhabitants of Troy. 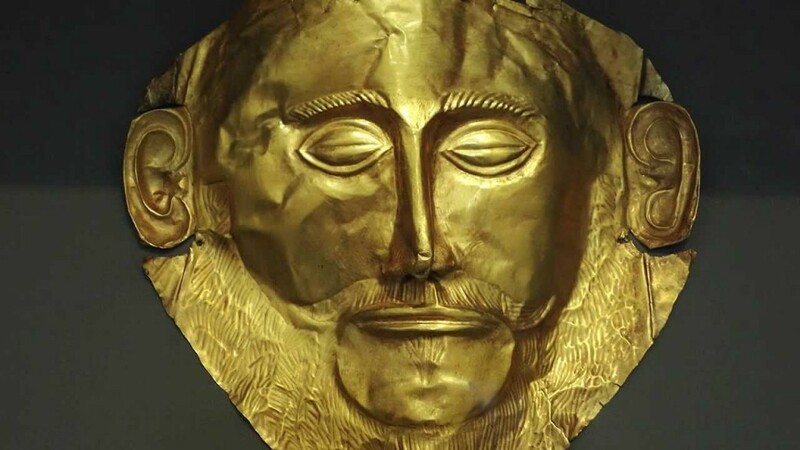 In 1876, German scientist Heinrich Schliemann had discovered what is said to be the”Mask of Agamemnon” during excavations on the island of Crete where he also unearthed elaborate golden artefacts. What is the meaning of Pergamon? The name Pergamon is derived of three words being that of per, gam or gamos and mon or man. The meaning of per is taken from heraldry being that is “divided by a line in the direction of.” The word gam or gamos is to represent a marriage or holy marriage and it is also where we get the English word game which is a form of play or sport, especially a competitive one played according to rules and decided by skill, strength, or luck. The name indicates the ancient spiritual and material battle in the form of a world-wide game for the rite to claim the title of the Throne of Caesar or the Tsar as Pontifex Maximus. A chess game through the Gnostic labyrinth of life that was created on the island named after a Greek word to create, Kriti, now called Crete at the temple and church of Pergamon. 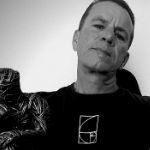 What happened to the Church of Pergamon and the Throne of Satan? The Cretans hold a distinct place in world history has one of the first primary builders of Western civilisation by inventing the first religions, secret rites, and method of writing that was ever practised in systems Europe. This is why Crete, the Cretans and Pergamon plays such a prominent role in the Scripture, and also in the time of the battles of the Gnostics when it was what Plutarch had called “Cretan against Cretan,” and they are labeled as the Nicolaitans. Saint John makes it clear that it is in this city Pergamon is where Satan lives, and the inhabitants who hold to the teaching of the God Baal or Balaam, who taught Balak to entice the Israelites to sin so that they ate food sacrificed to idols and committed sexual immorality, and who hold to the teaching of the Nicolaitans. This was a battle for power, knowledge and control of all the Temples in the world. A time we can say that we had the Romans under the family of Caesar on one side, and their cousins of the Greeks under the family of Ptolemy on the other. Crete was the most holy and political power centers in all the world. What they had known as the center and naval of the world. These power struggles for the island eventually led to the destruction of the ancient temple in Pergamon under the Romans in the 1st century BC, and the first temple of the Roman imperial cult was built in Pergamum (c. 29 B.C.) in honor of Rome and Augustus. Later the Goths destroyed the Temple of Augustus in the 4th century AD. Soon thereafter, the temple was converted to a church and eventually became one of the main seven churches of Asia controlled by the power of the Universal Brotherhood united with the symbol of the double headed Phoenix under the Roman and Greek Catholic Church. After a slow decline, the city was favoured by several imperial initiatives under Hadrian (117 – 138). It was granted the title of metropolis and as a result of this an ambitious building programme was carried out: massive temples, a stadium, a theatre, a huge forum and an amphitheatre were constructed. In addition, at the city limits the shrine to Asclepius (the god of healing) was expanded into a lavish spa. Fast forward to during the time when the NAZI’s had sought to rule the world under German Chancellor Adolph Hitler, they began excavating the alleged altar on September 9, 1878. Hitler’s main archaeologist was Carl Humann who with his team moved the Throne of Satan back to Germany where it was reconstructed. Its erection was celebrated in Berlin in the year 1902, and 31 year later 1933 Adolph Hitler was elected Chancellor of Germany. 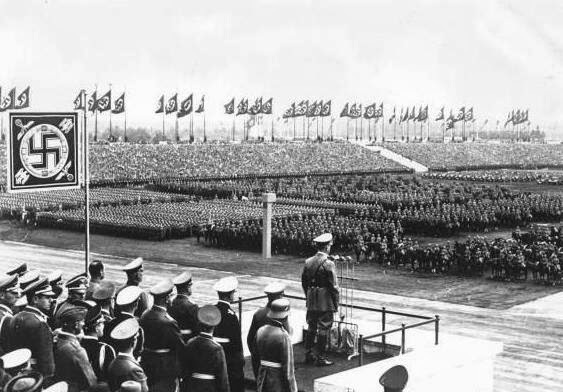 The NAZI Führer became the defacto dictator in 1934 and would later sit on the Throne of Satan when he ordered construction of the Tribune at Zeppelin Field in Nuremberg for future speeches. 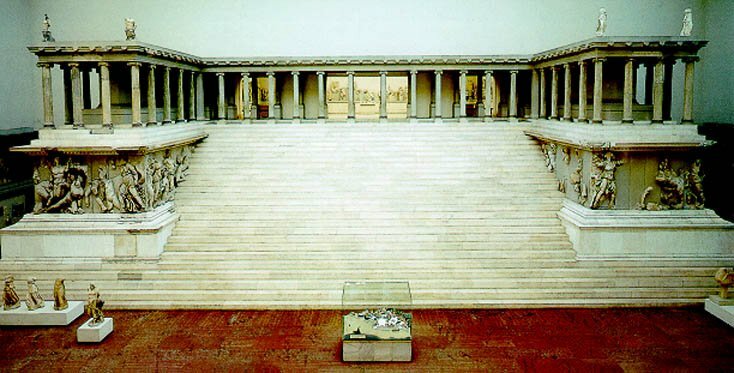 A German architect, Albert Speer had modeled Hitler’s podium for the Tribune after the original Pergamon Altar. In 1939, Hitler would commence World War II from this very Altar.After his defeat by the Russians in 1939, the Soviets dismantled the Pergamon Altar and shipped in to Leningrad in 1948 as war loot. But later returned the Throne of Satan in 1958. And the Christian name now is not wholly, though almost extinct; for when our countryman, Dr. Smith (x), was there, there was a little church called St. Theodore’s, whither a priest was frequently sent from Smyrna, to perform divine service, there being but a very few Christian families in it. This church represents the church from the time of Constantine, and onward, rising up to, and enjoying great power, riches, and honour Pergamos signifies high and lofty; things that were sublime and lofty, were, by the Greeks, called , and also all high and lofty towers (y). This is confusing. So there were two Pergamon ? With Hitler being born and the Nazi Party founding in 1920… excavating in 1878… 1902. I don’t get it. What’s up with that?